Xylitol Market size was over USD 750 million in 2015 and expects gains at above 4% up to 2023. Positive indicators for consumer spending on natural based low calorie sweeteners along with growth in diabetic care products demand is likely to drive global xylitol market size. Key performance metrics, low calorie, excellent taste, versatility & equivalent sweetness, minimal effect on blood sugar & insulin levels, and reduces carbohydrate cravings & binge eating, should favor product demand. North America and Caribbean is the highest spending region for diabetic drug consumption. The region spent over USD 340 billion in 2015. Obesity has become a notable contributor to rising healthcare costs in the U.S. Approximately USD 150 billion is spent on adult obese treatments. The condition is a leading cause of type 2 diabetes, heart disease, morbidity, disability, and mortality, resulting nearly 112,000 deaths in the U.S. per year. The WHO estimates that on an annual basis, 2.8 million people die as a consequence of being overweight that includes obesity and roughly 35 million of global disability-adjusted life years (DALYs) result from obesity. These conditions are found to be the cause of adverse metabolic effects on blood pressure, cholesterol, triglycerides and insulin resistance. Xylitol consumption may prove to be an important strategy towards weight control techniques with product consumption through food & medicines which slows stomach-emptying and its low glycemic index. This polyol is incompletely absorbed and the consumed portion is converted to glucose and activates the lutathione antioxidant system which helps to squash free radicals. Unabsorbed portion of this polyol acts like dietary fiber, helping to maintain healthy gut function. These health related factors may drive xylitol market size. Increasing sugar-free gums demand along with rise in confectionary sales based on natural sources should favor xylitol market demand. China is one of the potential growth market for both gum and confectionary market owing to its high GDP of over USD 5.8 trillion in 2013. China was the second biggest confectionery market in Asia, and generated over USD 9.5 billion business, following Japan registering over USD 10 billion in sales. China has experienced an average GDP growth of approximately 10%, which has resulted in rise in middle class disposable income levels. In addition, Chinese urban populations have grown from approximately 150 million over the past ten years. By 2025, China may witness a rise in urban population which can grow from 607 million to 822 million people. This may provide huge growth potential to drive xylitol market size. This industry may witness substitute threat from sugar polyols such as sorbitol, mannitol and maltol. Global sorbitol market size was over 1.8 million tons in 2015 and should surpass 2.3 million tons by 2023, with expected gains at over 3.5%. Key raw material, corncob required for xylose production, may witness tight supply situation owing to huge demand in food and biofuel applications. This factor may put pressure on xylitol market price trend and affect production. Chewing gum applications dominated the overall xylitol market share and generated over USD 450 million in business for 2015. Xylitol chewing gums prevent dry mouth, tooth decay risks, and boosts oral health in children and adults. It acts as a sweetener in both, pellet and stick form of chewing gum, and provides flavor and cooling effect. Food applications should register highest gains at over 7% owing to rising consumer preference for natural sweetener in diet and prevalence of lifestyle diseases like debates & obesity. Positive indicators for growing application in beverages and bakery products (cookies, pastries, pies and cakes) should drive xylitol market size. Personal care application should witness significant gains owing to this polyol based formulations in toothpastes, mouthwash and fluoride tablets. Growth in working class population particularly in the U.S. along with increase in convenience products demand owing to hectic lifestyle may drive oral care product demand. Derivatives include ethylene glycol, propylene glycol and xylaric acid and do not require any technical development for production. It can act as building blocks for manufacturing PET, anti-free agents, de-icing fluids and UPR. According to industry analysis, conversion results have shown around 80% yield of ethylene and propylene glycol. 90% yield achievement could improve production economics which demands low cost xylose sugar stream. Germany xylitol market size generated over USD 65 million business in 2015. Chewing gum industry served as an important driver for regional market growth over the past few years. Chewing gum manufacturers have established itself as an important position in dental care segment and are targeting young population base with energy boosting benefits. Finland xylitol market share may witness above average gains and register close to USD 8.5 million by 2023. Increasing health concerns related to excess sugar intake and health claims pertaining to this sugar polyol consumption is popular among Finish population. Chewing gums manufacturers are introducing new product portfolio and carrying out marketing campaigns targeting young population base. China xylitol market size may witness highest gains over the forecast timeframe and achieve close to 25 kiloton consumption by 2023. China exports almost 50% of this polyol produced to U.S., Finland, Poland, Japan, UK, Russia and Argentina. Confectionary applications in China should witness robust growth over the forecast period. Global xylitol market share is moderately consolidated with top four industry participants catering to over 40% of the overall demand. Major industry participants include Danisco (DuPont), Futaste Pharmaceutical, Yucheng Lujian and Hangzhou Shouxing. 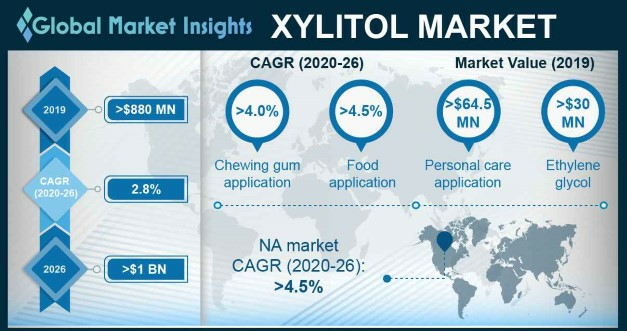 Futaste Pharmaceuticals is among the leaders in Asia Pacific market xylitol market share and occupies strong position in the international share. Other key participants include Roquette Freres, ZuChem, Inc, CSPC Shengxue Glucose, Thomson Biotech and DFI Corporation. Majority of xylitol production capacity is concentrated in China, which has emerged as an important export destination. Chinese manufacturers have almost doubled the manufacturing capacity which have resulted in over supply, resulting into severe price competition and industry consolidation. Xylitol is a natural carbohydrate, classified as a polyhydric alcohol or sugar alcohol. All 5 carbon atoms bind to a hydroxide group; thus, the molecule has no reducing groups. This polyol is a sugar substitute with 40% less calories and a member of the sugar alcohol or polyol family, which includes other common dietary sweeteners such as sorbitol, mannitol, and maltitol. It is a natural sweetener found in low concentrations in fibres of many fruits and vegetables. It can also be extracted from berries, oats, mushrooms, corn husks and sugarcane bagasse. The industrial production starts from a hemicellulose extracted mainly from corncobs or hardwood, which is hydrolyzed into xylose and catalytically hydrogenated to the end product.